Ilford Multigrade ART 300 is a unique fibre based paper with a fine art textured surface, achieved with a 100% cotton rag, acid free, base which has been carefully milled to offer a wet strength ideal for the archival processing and washing. The new surface delivers a matt fine art print that has both a texture and what some users have described as an eggshell sheen. 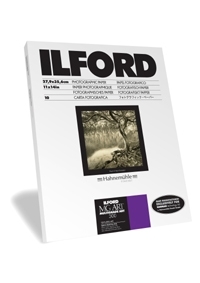 Compared to ILFORD FB (baryta) papers slightly shorter wash times are achieved, and the paper can easily be handled in large sheets thanks to its 300 GSM weight.